February 21, 2014  The Federal Reserve has released transcripts from more than a dozen meetings that took place in 2008, as Fed officials and other regulators struggled to get on top of an unfolding crisis. February 18, 2014  Over-all health care cost increases have slowed dramatically, but consumers may not notice it. Many face higher deductibles, co-pays and out-of-pocket maximums as employers' insurance plans try to encourage them to pay more attention to health care costs. One big problem is health care price information is often not available. 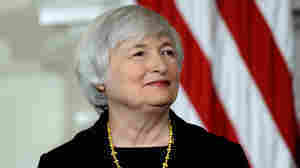 February 11, 2014  Janet Yellen made her first appearance before Congress as chair of the Federal Reserve on Tuesday. Her remarks, released prior to her testimony, stressed that there would be a lot of continuity with past policies, because she had helped develop and implement them. February 7, 2014  The government's latest unemployment report showed the economy still struggling to bounce back from a weak report in December. Employers in January added 113,000 to payrolls, far less than expected. The unemployment rate did notch down to 6.6 percent. February 7, 2014  The Labor Department releases the January jobs report Friday morning. December was a big disappointment. Analysts are puzzling over why an economy that's growing at a better than 3 percent clip can't produce more jobs. February 6, 2014  The Congressional Budget Office said this year's deficit is likely to be about a third the size it was in 2009, when the Great Recession bottomed out. A better economy is the main reason for the improving deficit, but moderating health care costs help. February 4, 2014  A new front has opened in the political battle over the Affordable Care Act, with Tuesday's release of the Congressional Budget Office's annual budget and economic outlook. The economists updated an earlier estimate about how many workers would leave the workforce because they no longer needed a job to have health care coverage — revising upward from 800,000 people to over 2 million people. Republicans pounced on the higher number, and President Obama now finds himself playing defense. January 29, 2014  Federal Reserve policymakers are wrapping up a two-day meeting as Fed Chairman Ben Bernanke prepares to step down later this week. Investors expect the Fed to stick with its plan to "taper" bond purchases and keep short-term interest rates where they are. 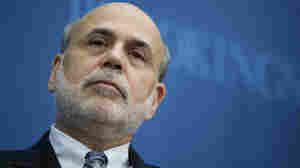 January 27, 2014  Federal Reserve Chairman Ben Bernanke will preside over his last Fed policy-making meeting on Tuesday and Wednesday. During his two terms as chairman, he faced a global financial crisis that threatened to become financial Armageddon, followed by a deep recession. January 22, 2014  The International Monetary Fund has updated its outlook for the world economy. The IMF boosted its forecast for global growth slightly. It also hiked its estimate for U.S. growth. January 10, 2014  The monthly jobs report released Friday morning was a disappointment. Economists were expecting 200,000 new jobs. Employers actually added just 74,000. The unemployment rate did fall to 6.7 percent, but it was mainly because many people dropped out of the labor force. January 10, 2014  Alcoa and a subsidiary of the the U.S. aluminum giant, will pay $384 million to the U.S. government for engaging in corrupt practices. The payment is part of a settlement in a bribery case involving the royal family of Bahrain. January 7, 2014  Health care spending continued to rise in 2012, but it did so at a relatively low rate for the 4th year in a row. The report from the Centers for Medicare and Medicaid Spending said overall spending on health care increased 3.7 percent over the previous year.